All pipelines must be tested before and after backfilling. This test is not covered by, I.S. 6: 2004 and ISEN 1916, but a pipe which complies with the Standard will usually comply with the air test provided it is laid correctly and the test equipment is in good condition. Failure to pass the air test should not preclude the acceptance of the pipeline if a successful water test can be achieved. Air testing, whilst being convenient for the contractor, is subject to many variants and special care must be taken to ensure that any indicated failure is not due to the test equipment as opposed to the pipeline. It is always more satisfactory to test a string of pipes correctly jointed rather than single pipes, because this will minimise the effect of any shortcomings in the equipment and will give an average for the line rather than an individual result, which may vary. A typical specification states that air should be pumped into the pipeline by a suitable means until a stable pressure of 100mm head of water is indicated on the U-tube and if, after allowing a suitable period for the pressure to stabilise, the air pressure has not fallen below 75mm during a period of 5 minutes, without further pumping, the pipeline should be accepted. The following test procedure is consistent with that described in BS 8301 / the Water Authorities Association publication “Sewers for Adoption”. Seal the ends of the pipeline by means of expanding or inflatable drain stoppers. We recommend the use of Mill test or A.T.O. type inflatable stoppers, which are light and reliable. Raise the internal pressure of the system until the ‘U’ gauge indicates slightly more than 100mm of water (50mm where gullies are connected). Purpose made drain testing equipment is so calibrated that the scale indicates the actual pressure in mm water gauge. Allow about 5 minutes for stabilisation of the air temperature (a 1º change in temperature is reflected in a change in pressure of about 38mm on the gauge). Adjust the pressure to 100mm (or 50mm if appropriate) by either introducing further air or by bleeding off any excess pressure. Observe the fall in indicated pressure over a 5-minute test period. The residual pressure should not be less than 75mm (or 38mm for a 50mm test). If a test fails, identify the cause. Leaks may readily be detected by applying a soap solution to all parts of the system while the air test is in progress. Temperature change can lead to an apparent failure of the air test (particularly if a cold wind is blowing across the pipes). If this is the case a longer stabilisation period may be necessary. The pipe shall be filled with water and provided with a standpipe so that the head is not less than 1.2m above the crown of the pipe at the highest point and no more than 6.0 metres at the lowest point. It may be necessary to test pipelines laid at a steep gradient in sections to remain within these limits. It is normal to allow the filled pipeline to stand full of water for a period of not less than 2 hours to allow for absorption prior to commencement of the test. If the loss of water over a 30 minute period, when topped up every 10 minutes, is less than 0.5 litres per metre diameter per linear metre of pipe run the test is considered acceptable. The use of CCTV is now quite widely used for the inspection of mature sewers to assess their serviceability, and also for newly laid sewers to identify any major defects at the end of the maintenance period prior to adoption by the appropriate authority. Close circuit television (CCTV) is used by many authorities for pipeline inspections. This is a visual check only and requires personnel who are not only experienced in the operation of the equipment but also in interpreting the results. Table 13 Shows the maximum number of pipe lengths to be tested before and after backfilling under normal site conditions. We strongly recommend that testing be carried out periodically during the pipe laying process for every three to four pipes as set out in B.S. 8010 Section 2.7 ie. British Standard Code of Practice for Precast Concrete Pipelines. Where backfilling is required as work progresses three to four pipes must be tested before and after backfilling. This practice is recommended to facilitate rectification of defects prior to backfilling. 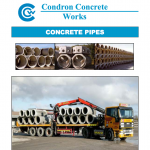 All concrete pipe work should be laid in accordance with the Manufacturers Instructions and the Supervising Engineers Specifications.